"This is my Grandmother's recipe for ice cream. 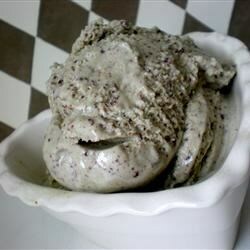 It's yummy, doesn't require an ice cream maker, very simple and can be made into any flavor of ice cream on the planet." For coffee flavor: 2 teaspoons instant coffee. For rum raisin: Soak a handful of raisins in rum for a few minutes. These are just a few of my favorites. You can really go wild, adding chocolate, fruit, spices... whatever you like. It's VERY versatile.